The new targeting engine is considered experimental and may be subject to change in later versions! Pimcore 5.1 introduces completely new targeting and personalization features by implementing a server side targeting engine which can be tightly integrated into other server side components such as the customer management framework or the ecommerce framework. The following section describes the technical concepts and aspects of the Pimcore targeting enginge. For usage description and feature listing see your user docs first. NOTE: the new targeting engine is incompatible to the targeting feature which was shipped with Pimcore before 5.1. See Migrating from the existing Targeting Engine for further details. VisitorInfo Contains run-time information on the current visitor and is used by all conditions and action handlers to collect/apply data. DataProvider Can be used by other components such as conditions to fetch data about the current visitor. E.g. the Device data provider loads device info from the user-agent string. Data is only loaded on demand if really needed by a component. Condition A condition which is being matched. Conditions are configured in the Admin UI for global targeting rules. ActionHandler A targeting rule can have one or multiple actions which are executed when its conditions match. These actions are executed by an action handler. E.g. the Redirect action handler creates a RedirectResponse which is used to redirect the visitor to another page. Storage Where data about the visitor is persisted to. Each storage implementation supports storage for the session and the visitor scope. Session scoped data is only valid for the current session - either defined by a expiry time or by technical implications of the storage (e.g. the Cookie storage just sets a session cookie for the session storage). Visitor data is valid for the lifetime of the visitor and should be persisted, but depending on the used storage (e.g. Session Storage) this might not be possible. Different storages exist, e.g. cookie, JWT signed cookie, DB, session and redis which all have their advantages and disadvantages. Targeting Rule A condition/action combination executing one or more actions if a set of conditions match (similar to pricing rules in the ecommerce framework). Targeting rules are usually executed on every request but depending on their scope (hit, visitor, session, session with variables) this can be limited. Target Group An entity which is used to target content for. A document/snippet can define personalized content for a specific target group (e.g. a special banner for a target group "Outdoor Interested"). 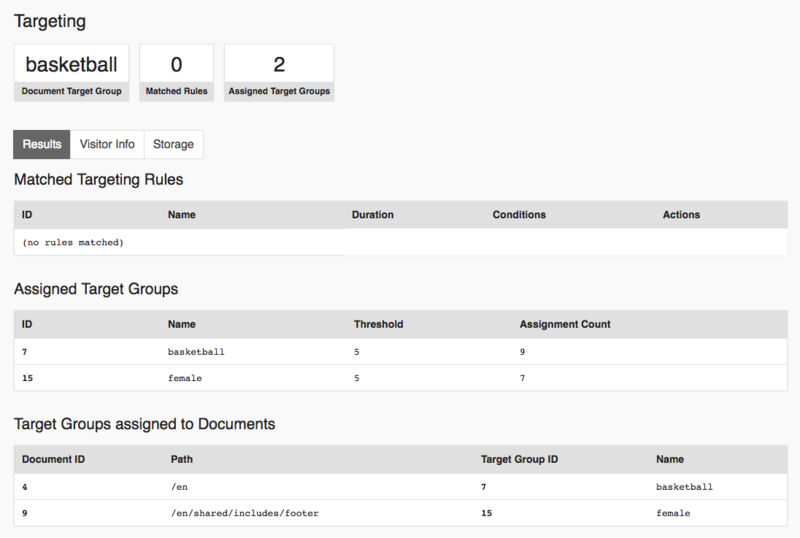 By matching targeting rules and by configuring target groups to be tracked when visiting documents, a visitor will be assigned a list of target groups (they will be stored to storage and be added to the VisitorInfo object at runtime). When rendering the document, a DocumentTargetingConfigurator selects the content which matches best for the target groups which are available on the VisitorInfo. When a request is handled, the targeting engine first creates a new VisitorInfo instance. This instance is a data container which will be used throughout the targeting process to store and pass data between different components of the system. See Visitor Info for details. After building the VisitorInfo and resolving the visitor ID, the matching engine processes every defined targeting rule. Based on the rule's scope a rule might be skipped (e.g. a session rule is applied only once per session). Every condition gets the instance of the VisitorInfo and needs to decide if it matches its configured data. To fetch additional data about the visitor, a condition can request data from one or more DataProvider implementations. As an example the Device data provider is able to resolve and cache device info from the user agent string by using the DeviceDetector library. The Operating System condition just defines the Device data provider as dependency and can rely on the device data being added the the VisitorInfo before matching. The targeting engine takes care of requesting data from a data provider only once per request, even if multiple conditions rely on its data. If a rule matches, a list of actions is applied. Example actions are issuing a redirect or assigning a target group to the current visitor. Actions (which are executed by action handlers) can request data from data providers in the same way as conditions. Some data needs to be persisted between requests. To do so, the targeting implementations makes use of a TargetingStorage which implements a key-value store for targeting data. Data can be set for the visitor (valid for the whole lifetime of a visitor) or for the session level. When storing data to an external storage, the previously resolved visitor ID is used to store data for a specific visitor. For further details see Targeting Storage. If the visitor has multiple assigned target groups, they will be sorted by their assignment count. The first target group in the sorted list which has personalized content for the document will be used. This logic is repeated for every document and sub-request. This means you can show personalized content for a given target group on a document, but have content for different target groups in snippets or renderlets rendered on the same page. You can see which target groups were applied to which document in the profiler. 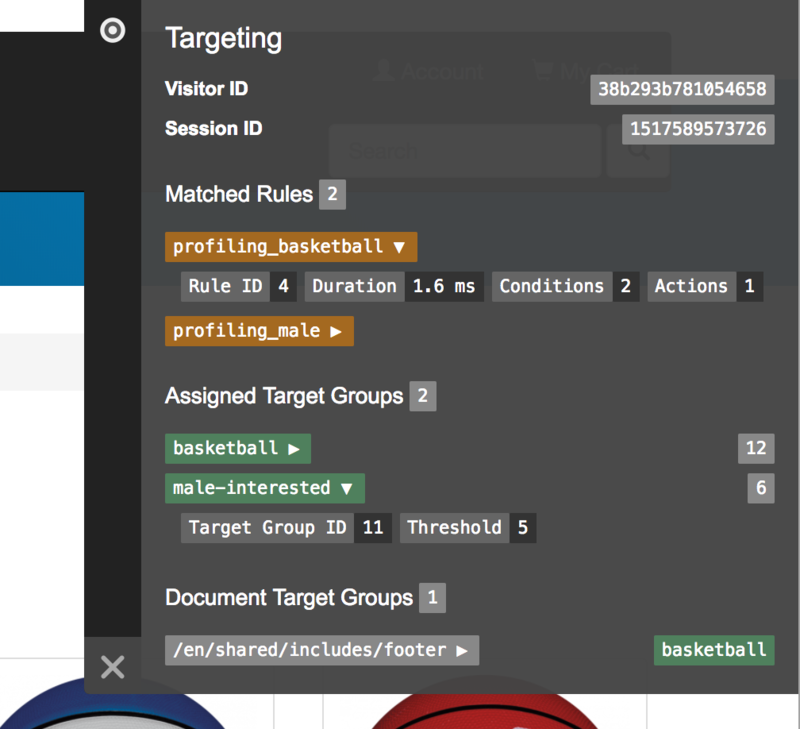 As you can see in the screenshot below, the main document used the target group basketball while the footer snippet was rendered with the target group female. The targeting engine is designed in a way to be easily extendable by third party code to extend and customize the engine's behaviour. As shown above, targeting date is added to the Symfony profiler. In addition you can enable a dedicated targeting toolbar which also works outside the dev environment when you are logged into the admin interface. You can give the user the possibility to opt-out from targeting at any time, by setting the following cookie: pimcore_targeting_disabled=1.